All UNM Bookstore locations including the Main Campus store, the North Campus/Medical Legal store and the Lobo Den Store at Wise Pies Arena will be loving their Lobos all weeklong Feb. 13-18 with a spectacular sale featuring 30 percent off Lobowear, spirit items and Lobo supplies in-store only at all locations. The UNM Bookstores continue to recceive great new Lobowear and gifts for the spring with unique looks for men and women for any occasion as well as great gifts for mom and dad, alumni and an adorable selection of Lil’ Lobowear for kids from infants to toddlers. Visit any of our locations and show how much you LOVE YOUR LOBOS and get a great deal at the same time. 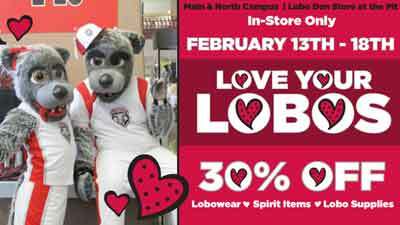 The UNM Bookstore will also be handing out coupons with any purchase good during March that could be 30, 40 or even 50 percent off any item of Lobowear, spirit items or Lobo supplies. For store hours at each location visit UNM Bookstore.